"I hope we can be happy where we are, be grateful for our blessings—now—here, accept the challenge that is ours and make the most of it, and don't be envious of others. "God help us to be grateful. Someone has said that an ungrateful man is like a hog under a tree eating apples and never looking up to see where they come from. 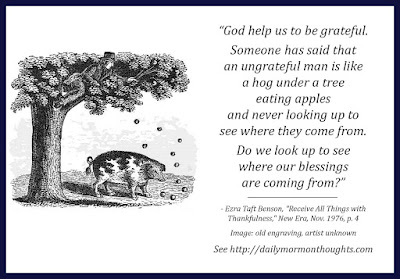 Do we look up to see where our blessings are coming from?" President Benson suggests that there are two tendencies that are both relatively easy to follow in our lives: choosing to be "dissatisfied and envious of other people" or learning to "cultivate the spirit of appreciation and gratitude." He invites us to choose the path of gratitude and thanksgiving for our blessings. With our very limited mortal vision, it's very easy to forget the source of our blessings. 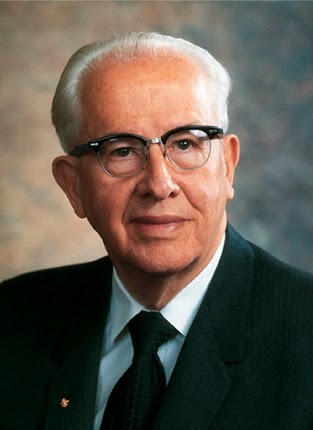 I've always been impressed by King Benjamin's teachings about how eager God is to "immediately bless" us as we follow him, leaving us "indebted unto him, and are, and will be, forever and ever" (Mosiah 2:24). Truly, we should be continually and eternally grateful.